The other half and I made the fatal error at the weekend of going to Sainsburys when we were hungry. It's something I'm sure that major supermarkets have missed out of their marketing plans, as we always seem to spend twice as much when we're hungry than when we've just eaten. One counter we can never seem to resist, hungry or not, is the fresh fish. There's something amazingly edible about the array of shiny seafood just waiting to be cooked and eaten. I don't normally like messing around with fish, especially whole ones, as I believe they really are best simply cooked with lots of seasoning. However, as we'd given in and picked up two delicious looking seabream (two for £7 - bargain!) I decided last night to do something a little different. Firstly, though, let me introduce you to Eric. 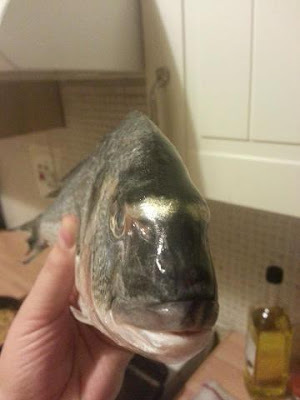 I'm sorry for those of you who are a little squeamish about such things that I keep naming my food, but whilst I was wiggling this one around the kitchen ("swimmy swimmy swimmy fishy!" Doesn't everyone do that? No?... ah, ok...) I noticed that he bore a startling resemblance to a certain famous French footballer-turned-actor. I love making my own pilau rice. Although I very much doubt this is particularly authentic (I've probably committed a cardinal sin akin to putting jam on a scone before cream... or is it the other way round...?!) 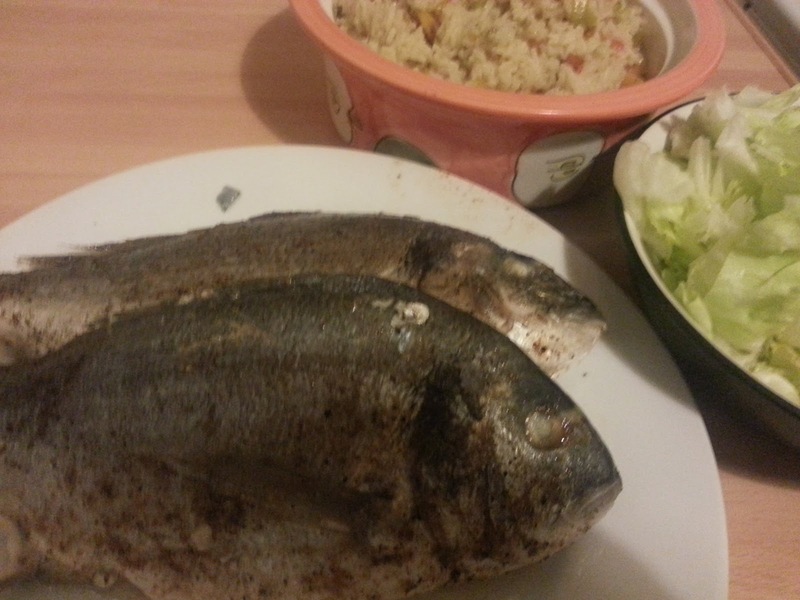 it tastes really fresh and is a great accompaniment to fish. 1. Melt some oil or ghee in a hot non-stick pan with a thick bottom, and add a teaspoon of each of the following: fenugreek seeks, coriander seeds and cumin seeds﻿﻿ for a minute, until the seeds start popping. 2. Add a finely chopped onion, 2 diced carrots, a chopped chili and a clove of chopped garlic and fry for 5 minutes, taking care not to burn the garlic. 5. Turn the heat down to very low, put a lid on the pan and cook for 25 minutes. When the rice has finished it should have absorbed all the water, and if you use a non-stick pan and put it on the lowest heat possible, you shouldn't have any stuck to the bottom. Rice is a funny thing though and it's not that easy to get perfect (I rarely do) so it's a good idea to check half-way through to see if it's gone bone dry - and if so, add some more water. Try not to add so much water that you have to drain it at the end, but if you do it's not a disaster - it just tends to lose a little of the flavour, in my view. In the meantime, clean out your fish if the fishmonger hasn't already done so, season generously with salt and pepper, and rub garam masala into the skin of the fish. Drizzle with olive oil, wrap in foil and bake in the oven for 25 minutes at around 200c. Before serving, rescue the cardamom pods from the rice as they are definitely not edible. I served mine with some chopped iceberg lettuce and lemon - I know it's a bit 70s but it's the only time I actually love iceberg, as the crispness of the lettuce and sharpness of the lemon compliments the heady coriander, fenugreek and garam masala flavours. Did Eric and George not meet? I'd like to have heard a little of their conversation.